Private Tour: Jungfraujoch from Bern Including Visit to Wengen. 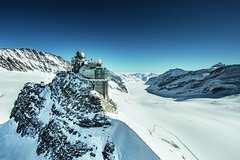 Spend a day at Jungfraujoch – Top of Europe with your private tourguide. Travel from Bern on an intercity train to Interlaken. From there via Lauterbrunnen to Wengen, where the annual Lauberhorn downhill ski race takes place. Continue on the coghwheel railway and enjoy the view at the scenic stop Eismeer. Shortly after that, you arrive at Jungfraujoch, 11,333ft above sea level. With your tourguide you discover the multimedia show, the Sphinx terrace, the exhibition “Alpine sensation”, the ice cave and the chocolate world of “Lindt”. Enjoy a beautiful panorama in the glacier world. Inicio en: Bernese Oberland, Switzerland.